A supercomputer simulation of the Milky Way-size dark matter halo. Underground experiments costing millions of dollars have still failed to find definite proof of the dark matter that supposedly makes up 90 percent of our Milky Way galaxy. But a much cheaper detector made of DNA could finally come up with the "smoking gun" for dark matter's existence. 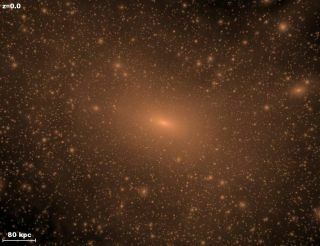 The smoking gun would come from finding both daily and annual changes in the detection of suspected dark matter particles called weakly interacting massive particles (WIMPs) — pattern changes that would fit leading theories about dark matter. Scientists have figured out how thousands of DNA strands can show the direction of incoming WIMPs for the first time, so that they can detect the proposed pattern changes. "The devil is always in the details and pilot experiments need to be done, but it is possible detectors could be built cost-effectively using known mature DNA manipulation and detection methods," said Charles Cantor, chief scientific officer of Sequenom, Inc. and co-author of a new paper describing the dark matter detector. Dark matter is part of the gravitational glue that theoretically holds the Milky Way galaxy and universe together, because visible matter alone can't explain the gravitational hold that prevents galaxies from flying apart. Scientists have estimated that dark matter makes up 25 percent of the universe and as much as 90 percent of our galaxy — now they need proof that only the new detector might deliver. The new detector idea came from Andrzej Drukier, a physicist-turned-biologist who has connections among both theoretical physicists and geneticists. Drukier has spent the past two decades working in biology, but he previously co-authored a 1986 paper that described the annual pattern change in dark matter. "We pointed out there would be an annual modulation," said Katherine Freese, a theoretical astrophysicist at the University of Michigan and co-author on the new paper. "At different times of year, you'll get a different signal." Similarly, the Earth's daily rotation should lead to a separate signal based on the daily pattern change in dark matter detection. The daily and annual signals would represent a "smoking gun" for dark matter, Freese explained, because they would stand out from the radioactive "background" of neutrons or similar particles that can also set off dark matter detectors. This image shows how a gold nucleus struck by a WIMP would fly through hanging strands of DNA and sever any that it hits. That path of destruction would allow physicists to calculate the direction of the incoming WIMP. The new detector could track the direction of an incoming WIMPs based on its setup — thin layers of gold foil with thousands of single DNA strands hanging from them. An incoming WIMP would knock a gold nucleus out of the gold layer, so that the gold nucleus flies through the hanging forest of DNA strands and snips the strands in its path. Finally, scientists could calculate the direction of the incoming WIMP that knocked the gold nucleus out of place. The new detector can even use stacked layers of mylar, gold foil and hanging DNA strands — like a book — to screen out cosmic rays and other background particles. A WIMP collision would only give a gold nucleus enough energy to cut through one layer before being stopped by the next layer's mylar, but cosmic rays would transfer enough energy for a gold nucleus to punch through hundreds of layers. Most existing dark matter detectors live deep underground to screen out radioactive background particle — a strategy that should work similarly well for the new detector. But the new detector would also have its added advantages for detecting definitive dark matter signals and screening out the background noise. "It is easy enough to put it underground, which can help with conventional cosmic radiation," said George Church, a geneticist at Harvard University and co-author on the new paper. The new detector based on DNA could also prove much cheaper — about $100,000 rather than millions of dollars for today's dark matter detectors, Freese said. But the group would need additional money to build a second-generation detector with much longer DNA strands that can detect the daily signal in dark matter's smoking gun. A first prototype could come together by the fall of 2012 using off-the-shelf technologies. The group has already worked out funding with the University of Michigan's "MCubed" program, which rewards interdisciplinary efforts cutting across many scientific fields.